I bought this for my daughter's business and I have never seen one before. I thought it was going to be an overpriced piece of thin plastic, but to my pleasant surprise this thing is really thick and well made. Awesome and well worth it! Super thick! It’s awesome! Cheaper than the Perform Better and probably better! Well worth it and will look wonderful in the gym to accommodate my FMS evaluations! We bought the grid to use with the posture app. The package made it to us in 2 days and was as described. I would buy another without hesitation and also recommend the posturezone app. 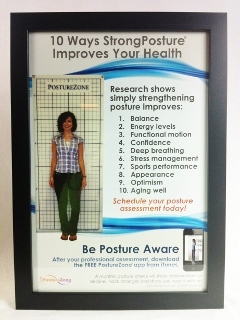 I saw the posture poster in a colleagues office so was familiar with the product. Quick shipment and I got a free poster a nice bonus. I love the simplicity of the grid. The only complaint I have is that because it is such a high quality plastic it is taking a bit to unwind from being in the shipping box. Excellent quality. Very pleased with purchase.